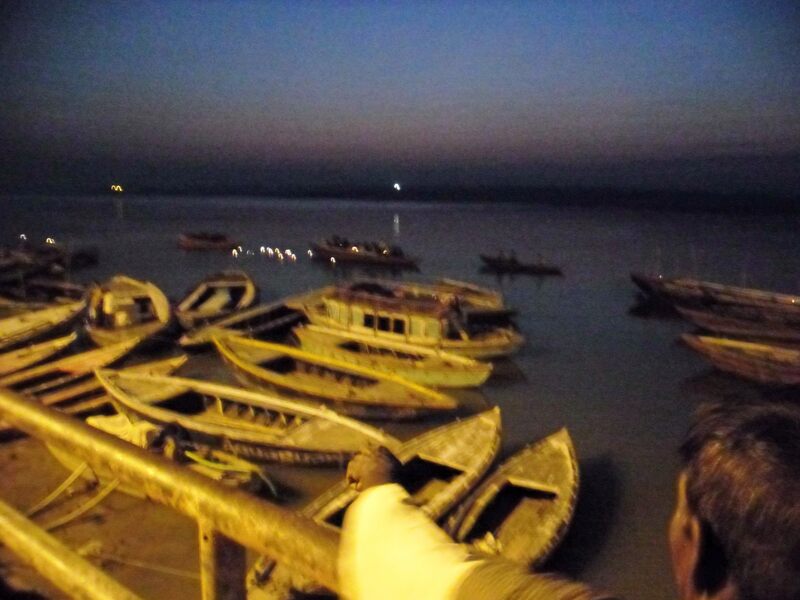 Boatman pointing out his craft on the pre-dawn Ganges, Varanasi. As I sift through photographs of my trip to India in preparation for an upcoming gallery display, I’ve dug out my travel journal in order to check my memories against my perceptions of the experience at the time. I’m not sure if this particular photograph will make the cut, although there’s something about the composition that I like. My impressions of the night it was taken, however, are worth sharing. This excerpt is from October 20, 2011. 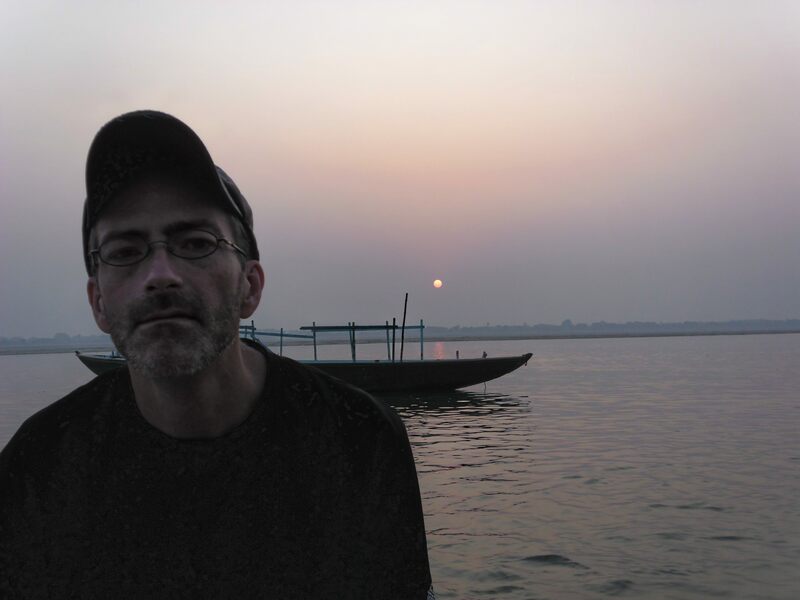 Several nights ago I bathed in the Ganges, an adventure that few embark on for the obvious reason that it is filthy and polluted, but I didn’t fly half way around the world just to look at the most holy river. It began as a lark with me, Max, and James on our last night in Varanasi as we wandered closer and closer to the river, eventually buying flip-flops and loogis and a guide along with them. We decided to hire a boat to “the other shore,” something every boatman seemed reluctant to do; police frown on it so late at night, and this upped the fee to 2000 rupees to get three of us across. We were led down ancient alleys in the oldest section of the oldest city, going places and seeing things that none of us had any business seeing. The beggars were gone, as the tourists stopped flowing hours earlier and blocks away. Scenes of depraved filth and poverty met us around every corner – dark, putrid, unpredictable; the type of situation where I knew I was way too close to the edge and wondered how much farther I could push it, since there was obviously no turning back. Finally, we emerged at the ghats near where we’d taken a boat ride that morning… it all looked familiar, yet sinister. The ghats of the Ganges look far different than they do in National Geographic. The entry ends there, preempted no doubt by the deep sleep that was my only respite from the chaos and sensory overload that is Varanasi. The boatman had taken the three of us very quickly to the far shore, fearful of being spotted and fined by the police. We’d all agreed that the best course of action was to cross the river in order immerse ourselves, the better to avoid contact with trash, the odd dead goat, and detritus from the funeral pyres upstream. The boatman urged us to “make haste” as we disembarked on a steep sand bar to wash away our sins. My newly acquired flip flops sank deep into the muddy sand as I held my breath, shut my eyes tight, held my nose even tighter, and crouched down into the opaque grey liquid until the top of my head was completely covered in dubious holiness. I never knew that water could actually be thick, but Max later concurred that that’s exactly what it was. James opted to pass on absolving a lifetime of sins rather than risk debilitating, gut-violating infection. Fortunately, Max and I were unaffected by full contact with the 5th most polluted river in the world, and James, as far as I know, has not been destroyed by his karma. We climbed back into the boat, unaware that our night’s journey would take us even closer to the edge of the Void. 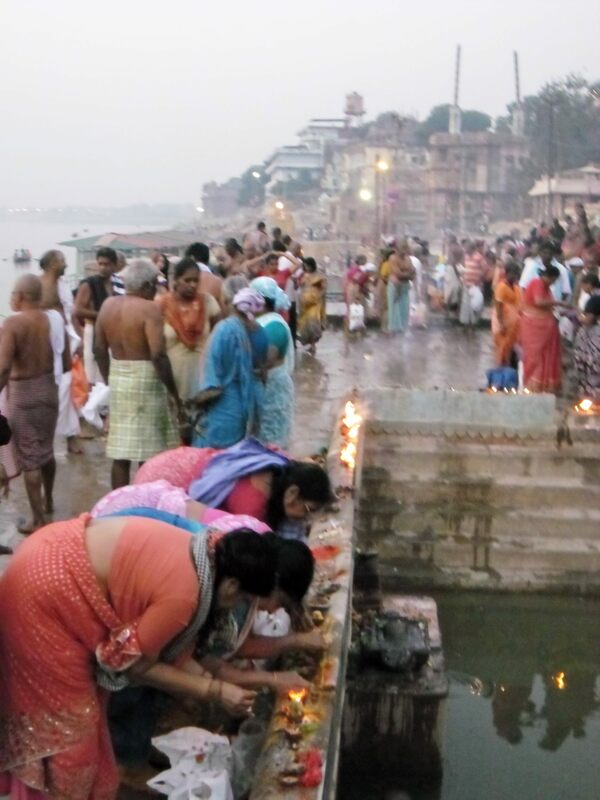 As we returned to the ghats, our guide offered to lead us to the funeral pyres, which it turns out, are basically large campfires fueled by wood typically purchased with the life savings of the departed soul whose earthly remains are placed on top. Although each corpse is wrapped in white cloth and dipped into the sacred river before being cremated, the entire procedure is best described as “unceremonious,” as there is a colossal waiting line. These fires have burned around the clock for over two hundred years in order to keep up with the demand, and not all those waiting in line are dead; there is a sort of hospice house above the ghat where the terminally ill await the good fortune of dying in this most holy city. I was surprised by my lack of revulsion or emotionality at seeing a pair of human legs sticking out of the flames like two oversized sticks of cordwood, so close to my own bare legs that the hair on my calves was singed by the heat. The unsentimental thought arose that the only difference between the two pairs of legs was a handful of years. The sweet, earthy odor of the smoke reached me along with the realization that there’s more to us than these hunks of meat that we insist on calling “me.” It’s humbling to consider that I’m not as limited as I’ve always assumed myself to be. The whole experience gave me the sense that none of us gets off The Wheel until we realize that “being born” and “dying” are ultimately the same thing. I think you’re right, entry and exit through the same door… it takes a lifetime to understand this maybe.